As the largest country in South America, Brazil offers an intoxicating fusion of people, cultures and otherworldly landscapes that has attracted explorers for centuries. The country was added to the map when Spanish and Portuguese explorers reached its Bahian shores in the late 15th century. 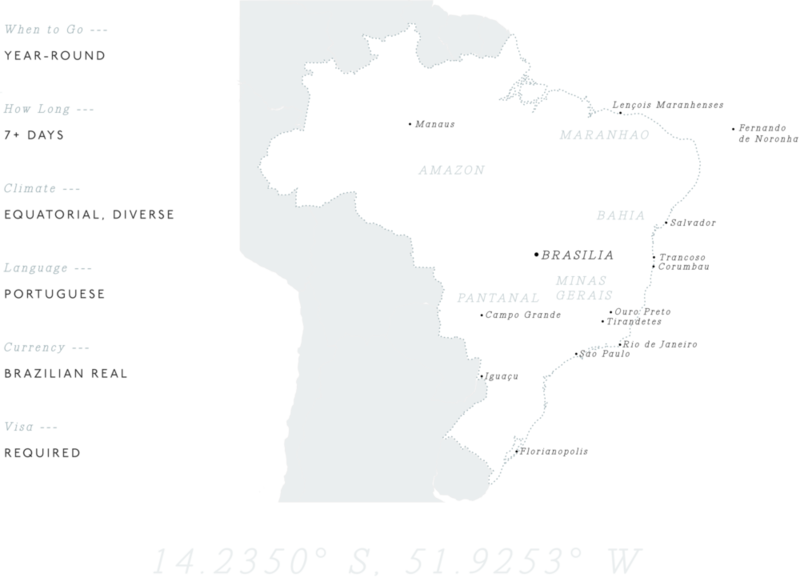 Back then, Brazil was the homeland of some 30 million indigenous people known as Amerindians. Over the centuries, waves of different peoples settled on its fertile lands, adding to the rich mix of its heritage, including Europeans, Africans and Japanese. Today, Brazilian people have a distinct taste for celebration, with a bubbly personality that lends itself to energizing music and colorfully festive parades. They take Brazil’s wild cities by a storm during Carnaval with tantalizing floats and rhythmic samba. The parties don’t stop there — the streets of Ouro Preto are carpeted with flowers for Holy Week; up north the Bumba Meu Boi festival blends indigenous, African and Portuguese folklore; and in Salvador de Bahia the Goddess of the Sea is venerated during the Celebration of Yemanja. The bold diversity of Brazil’s nature deems it worthy of being first in many categories. 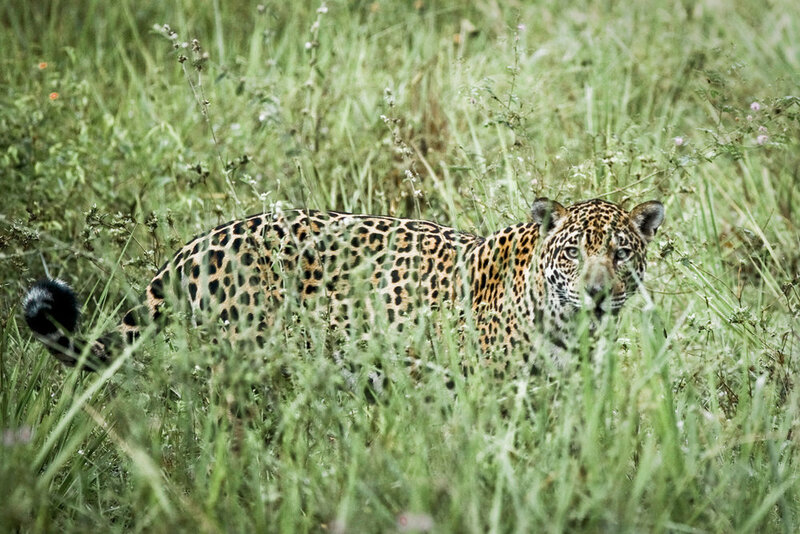 With over four million plant and animal species, Brazil has an unmatched variety of wildlife.Its vast Pantanal region, a flat swampy area, is the greatest wetland on Earth and supports the staggering number of fauna with giant anacondas and caimans. The Amazon, the world's largest forest with at least 70 uncontacted tribes, has a network of waterways that make up the longest river on Earth. To the south bordering Argentina is the biggest waterfall system in the world: Iguazu Falls (one of Brazil's 21 UNESCO sites). And to top it off, Brazil boasts the globe's best beach, no less: Baia do Sancho. 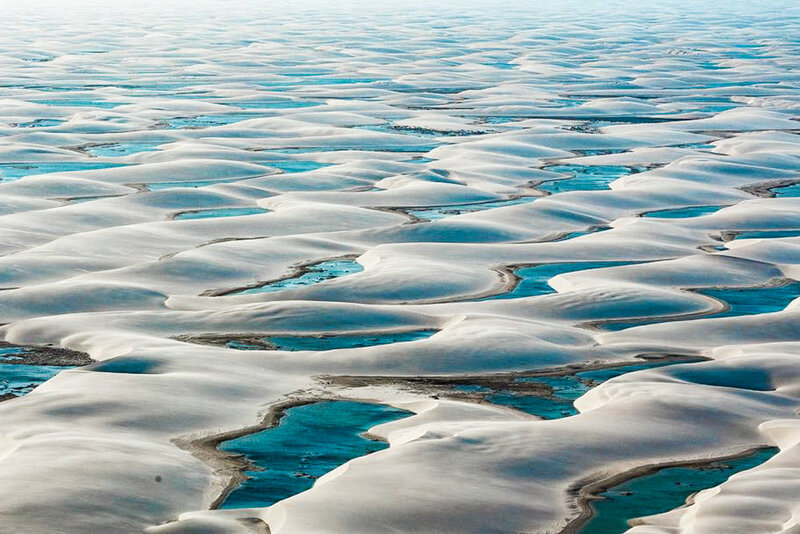 Brazil has it all: the adrenaline seeker can dive in the crystal-clear waters of the island of Fernando de Noronha, slide down the dunes of Lençois Maranhenses and trek through the Amazon rainforest; the history buff can explore the many cultural layers of Bahia and the colonial towns of Ouro Preto and Tiradentes; the traveler looking for repose has the coastal belt of Brazil, fringed with long stretches of pristine white-sand beaches and happy-go-lucky villages. One of the most stunning urban landscapes in the world, Rio de Janeiro's steamy beaches, dramatic mountains and colorful streets sway to the sound of Samba and Bossanova. The largest equatorial forest in the world and the lungs of Earth, the Amazon is home to great biodiversity across its vast changing landscapes. Brazil's state of Minas Gerais is dotted with exquisite colonial towns that bear testament to the Golden Rush of the 18th Century. Ouro Preto, meaning 'black gold', is contemporary hub for education and the arts, and preserves many of the original churches, buildings and cobbled streets of the colonial period. Remote and disconnected, the tropical basin of Pantanal hosts a unique array and diversity of species, most notable the pantanal jaguar and yacare caiman. Trancoso retains its original colonial foundations and a bohemian flare from the seventies hippie movement. Located on the unspoilt Bahian coast, this the perfect place to unwind. Trancoso's charming Quadrado, surrounded by brightly-colored casitas are home to local and international artists alike. Established as the capital of the Portuguese colonies, Salvador is an efervescent melting-pot where Africa meets Latin America. A visceral experience of raw power and earthly beauty, a total of 275 individual terraced waterfalls that sit at the frontier of Brazil, Argentina and Paraguay. A volcanic archipelago, this UNESCO site holds a beautiful yet delicate eco-system of volcanic rock and unsullied turquoise waters, a paradise for divers. Following the footsteps of the first Portuguese explorers, delve into the heart of Brazil's colonial remnants in the original mining town of Ouro Preto and surrounding hill stations. With the guidance of a historian, unravel the religious, civic and political significance of this region through its architectural remains and unique urbanism still in use. Explore the country's very first settlement, home to the largest African population outside of Africa and a mix of Portuguese and Indian traditions. 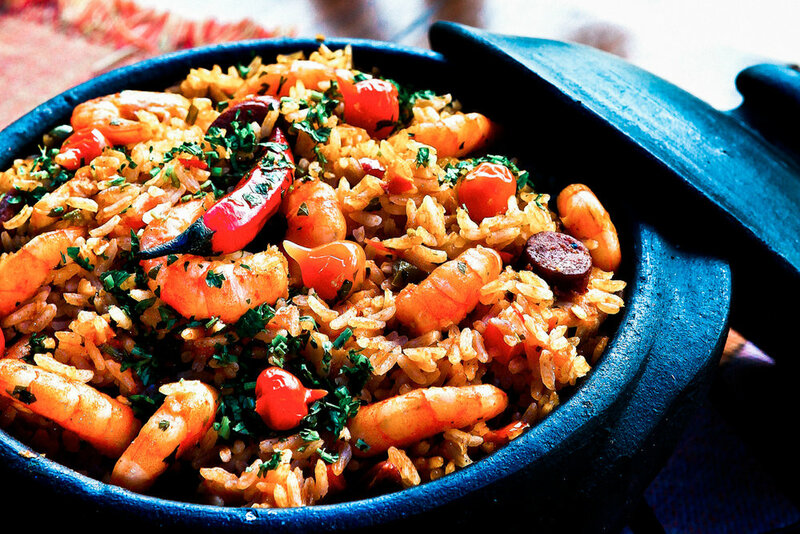 Take a cooking class with a Bahiana, ride a buggy with an Amerindian through his community's reserve, and learn the art of Capoeira in front of Brazil's very first church. Travel through some of the most remote regions of Brazil to connect with nature in its most pristine form. 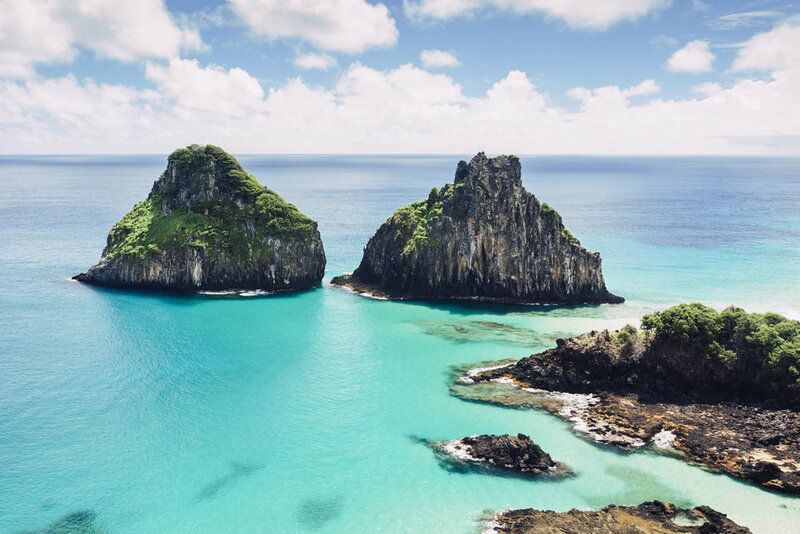 The volcanic archipelago of Fernando de Noronha, an ecological sanctuary off the northern Atlantic coast, the Pantanal wetlands, the Amazon rainforest and the northern national park of Lencois Maranhenses. Plan your trip around one of the Brazil's many cultural and religious celebrations that take place across the country, including Carnaval, New Year, Festa do Peao - "the cowboy festival", Cirio de Nazare in the Amazon, and Yemanja, which celebrates the Goddess of the Sea.